This weekend marked the 150th anniversary of the Battle of Bentonville. In commemoration, a reenactment of one of the last major battles of the Civil War took place near Four Oaks, North Carolina. The event also featured lectures, living history displays, sutlers’ tents, and soldier encampments. Thousands attended the event, which was expected to be the largest crowd to attend a Civil War reenactment in North Carolina. The Battle of Bentonville took place near Four Oaks on March 19-21, 1865. Union General W.T. Sherman, on his rampage across the South, ripped through the state, dividing his army into two as it headed north from Fayetteville to Goldsboro. Confederate General Joseph Johnston tried to stop Sherman’s advance, but was unsuccessful when the two Union forces reunited. 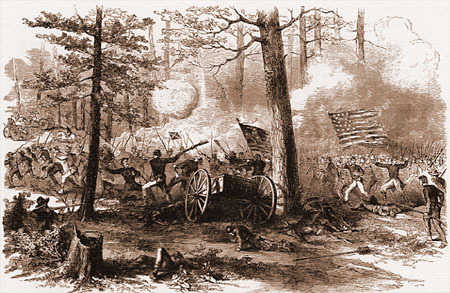 The battle led to Sherman’s ability to capture Raleigh on April 13. Many spectators expressed their appreciation for the event, including Leon Dockery. “I’ve never been to a reenactment and I was curious about how that worked … I wanted (my children) to be exposed to more than what they may hear from me or read in a textbook,” he said.